GEO ExPro - Faroe Islands: Will the ‘Land of Maybe’ Eventually Deliver On Its Hydrocarbon Potential? Faroe Islands: Will the ‘Land of Maybe’ Eventually Deliver On Its Hydrocarbon Potential? 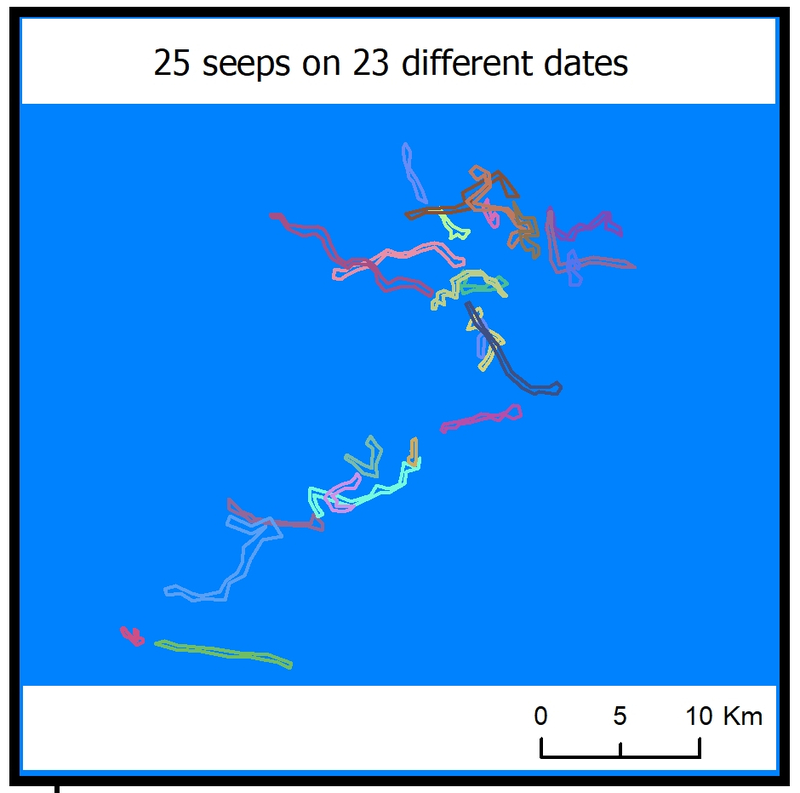 The use of several hydrocarbon seep interpretations over the same area in time-lapse 4D surveys can pave the way for new geological ideas on the Faroe Islands. .© Bernard Cooper. ‘Kanska’ might be the most famous word in the Faroe Islands - just ahead of the name of legendary football player Torkil Nielsen, who scored the winner against Austria back in 1990 in the first official football game played by the Faroes after gaining FIFA membership. The iconic alias ‘Land of Maybe’ was given to the Faroes by a British soldier while occupying the Islands during World War II. For the Faroe islanders, ‘Kanska’ means ‘Maybe I’ll do this’; as in ‘Maybe I’ll go fishing, maybe not’. In a country very dependent on the weather around this remote and rocky North Atlantic archipelago in the middle of nowhere between the Shetlands and Iceland, it is an important concept. For many years there was a boundary dispute over the ‘White Zone’ between the Faroes and the British, which was finally resolved in 1999. It was primarily over fishing rights, but was also of importance for oil and gas, as the majority of the discoveries in the region lie close to the border – but in British waters. 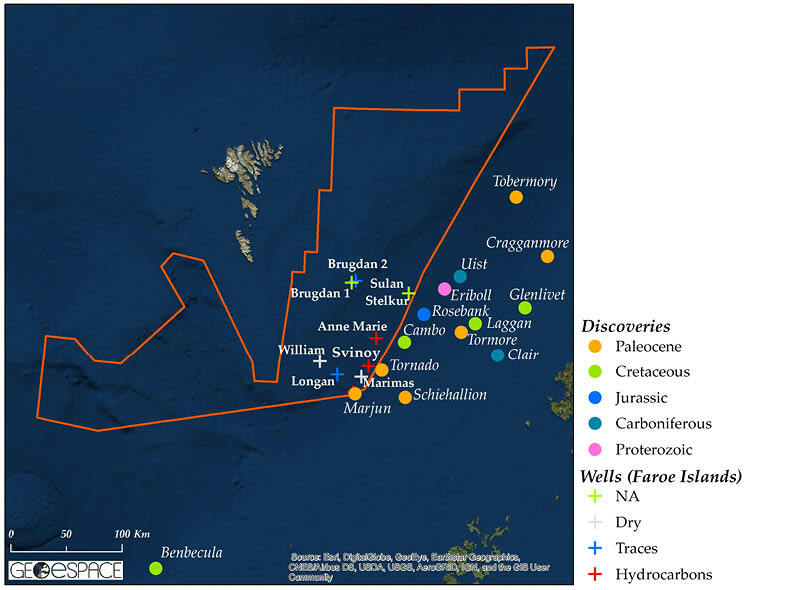 These include Clair, found by BP in 1977, Foinaven and Schiehallion, discovered, again by BP, in the 1990s, and lately and even closer to the boundary, Chevron’s Rosebank and Hess’s Cambo, as well as the Benbecula gas field, just 100 km south of the Faroese waters (see GEO ExPro article "Into the ‘White Zone’: Exploration in the North-West Atlantic Margin"). Call it a curse, a play of heads or tails, or just the irony of geology, all of this can look quite unfair from the point of view of the partly self-autonomous archipelago, which is heavily reliant on a single resource: fishing. Figure 1: Main discoveries in West of Shetlands and well results in Faroese waters. The red polygon identifies the areas available under the Faroese Open Door policy. Source: Jarðfeingi. Surrounded and teased by the West of Shetlands discoveries (Figure 1), new hopes were raised when Amerada Hess announced the Marjun discovery in 2001 - for once in Faroese waters - which found a Paleocene reservoir with somee light oil (see GEO ExPro Article "Faroe Islands: Success Near"). 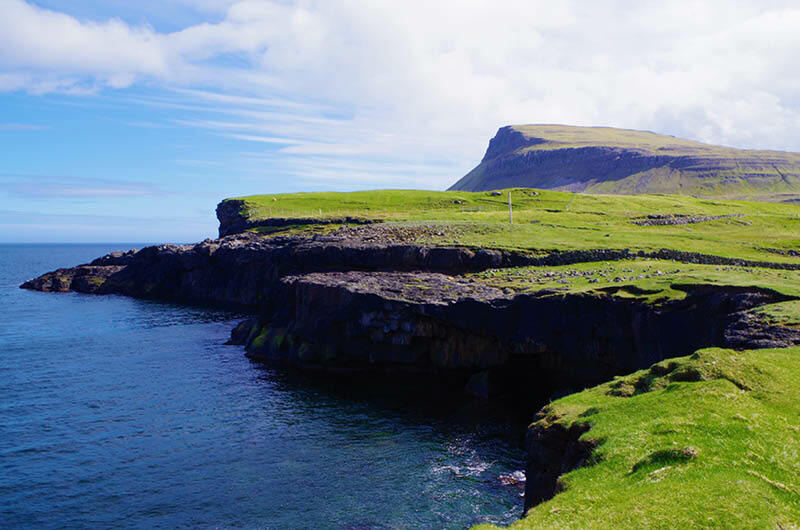 Spirits were flying high, as were claims of independence from Denmark, but Marjun turned into a fading dream with no tomorrows, and pretty much nothing was heard from the Faroes until ENI’s Anne Marie discovery of 2010. Yet again, Anne Marie did not match up to expectations because, like Marjun, the reservoir was of poor quality. Based on this, one might conclude that, in the hope for oil, just like in football, the Faroes seemed to be resigned to the fate of remaining underdogs forever. Despite huge technological progress made over the years, seismic had always been the primary weakness in Faroese exploration, because of the messy, thick basalt conditions found in this volcanic region, which effectively obscures much of the signal. However, when seismic technology cannot see well enough ‘downstairs’, an alternative might be to look ‘from above’. For some time satellite SAR (Synthetic Aperture Radar) seep studies have proved their worth both in frontier areas, where they help exhibit the extent of petroleum systems, and in mature environments, where they can be used to confirm active hydrocarbons migration pathways and leaking faults. Satellite optical imagery, which has been used onshore the Faroes, can also provide additional knowledge for onshore geology for dykes, fractures and faults (Ziska, 2012). 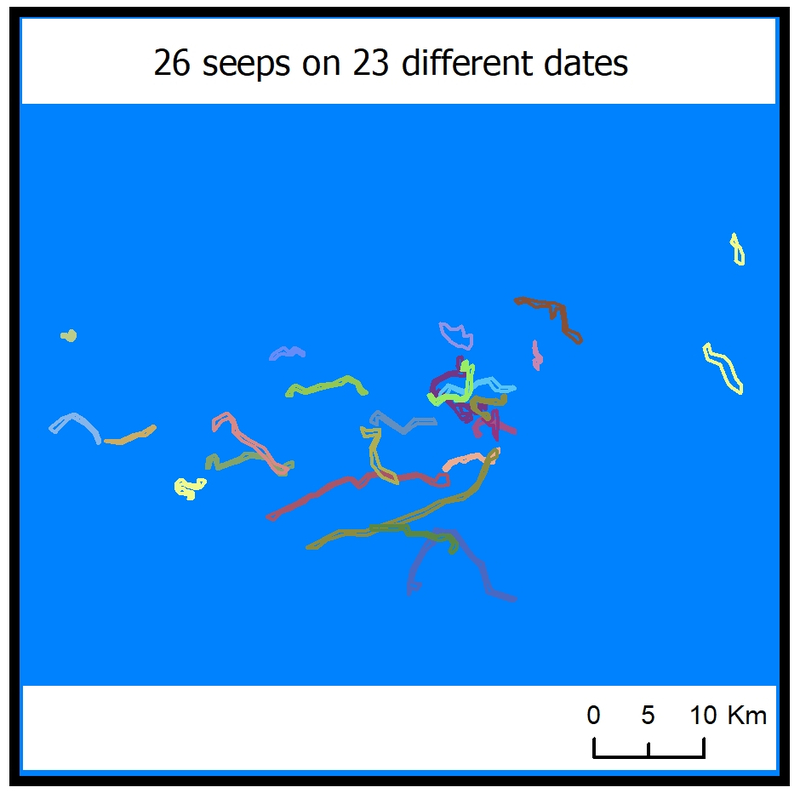 One of the purposes of the ‘quick-look’ seep study described in this article was to observe whether a new seep interpretation can highlight fresh areas of interest compared to previous seep studies, retrieved from Jarðfeingi, the Faroese Geological Survey. Making comparisons does not mean that one interpretation is better than another, or that one is all correct and the other one is all wrong. It is time to accept that seep interpretations are similar to any other traditional G&G analysis: we should welcome several seep interpretations in the same area in time-lapse 4D surveys, allowing broader knowledge to pave the way for new geological ideas. 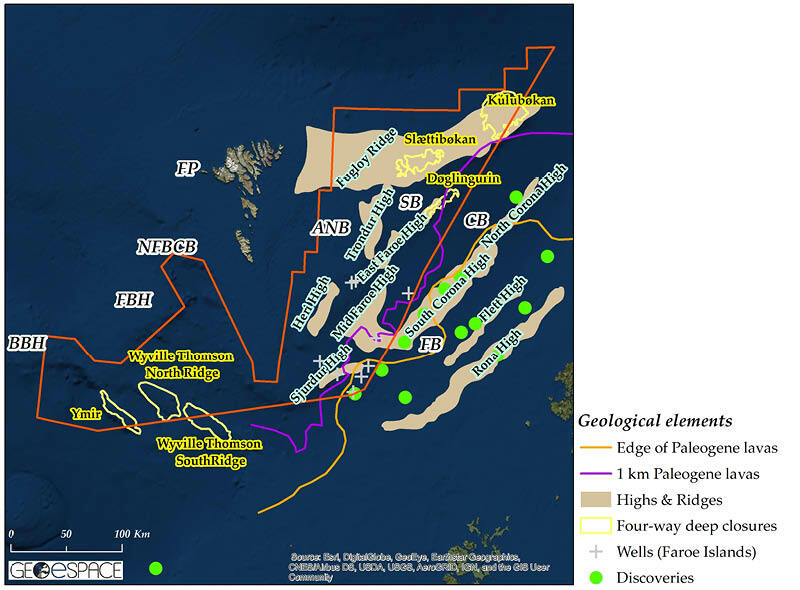 Figure 2: Map showing the main geological elements south and east of the Faroe Islands. SB = Steinvør Sub-basin; CB = Corona Sub-basin; FB = Foula Sub-basin, ANB = Annika Sub-basin; NFBCB = North Faroe Bank Channel Basin; FP = Faroe Platform; BBH = Bill Bailey’s High; FBH = Faroe Bank High. Sources: Moy & Imber; Jarðfeingi. The Faroes – Shetland Basin is located mainly offshore between the Shetlands and the Faroe Islands. Geologically, it encompasses a number of sub-basins separated by north-east trending structural highs (Andersen, 2003) some of them containing hydrocarbons fields. These basins and highs (Figure 2) relate to the successive fragmentation from Triassic to Paleocene of the Pangea supercontinent. The Atlantic Ocean opened up between the Faroes and Iceland from 54 My (Lower Eocene) onwards, which led to the setting up and spreading of proper oceanic crust and the subsequent drifting of Greenland away from Europe. Just before this break-up very large volumes of extruded magmatic rocks developed within the North Atlantic Igneous Province, which spreads from Greenland to Great Britain, with the first emissions dated at 63 My (Paleogene). 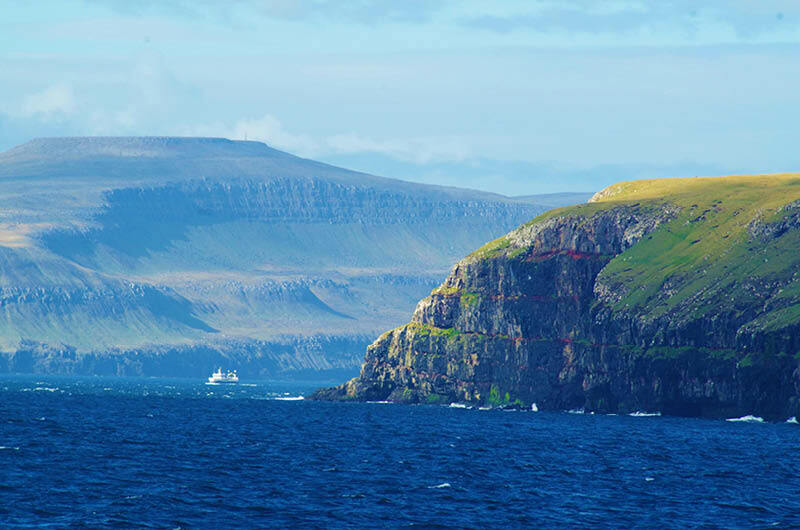 This ten million years of volcanic activity led to a more than 6 km-thick volcanic series, as exhibited onshore in Suðuroy, the most southerly isle of the Faroes (Lopra 1/1a well). These very thick volcanic deposits mean that little is known about the pre-Paleogene geology on and around the Faroes, as the seismic waves are strongly affected by the thick, dense and reflection-less volcanic screens, which prevent the acquisition of good subsurface images at both regional and local scales. As a result, it is difficult to generate accurate basin models and successfully pursue hydrocarbon exploration. In order to partially and indirectly solve this tricky question, it is suggested that hydrocarbon seep detection based on radar (SAR) satellite images is used. If they can be clearly identified, seeps imply that source rocks are present and within the oil window and consequently, that pre-Paleocene sedimentary basins exist below the thick lava flows. 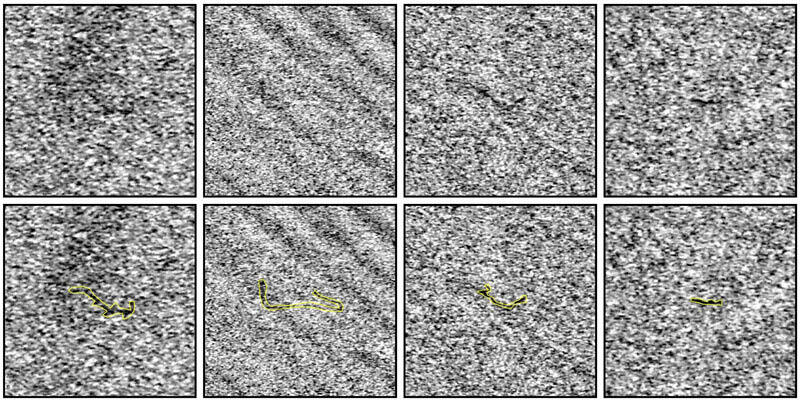 Potential pitfalls in this method relate to the very meaning of seep locations. They could actually correspond to the oil kitchen itself, thanks to vertical migration, or alternatively to structural highs to which hydrocarbons have migrated, where they are trapped and slightly leaking through seals or spill points, as seen in other parts of the world in large oil fields like Cantarel (Mexico) or Block 17 (Angola). 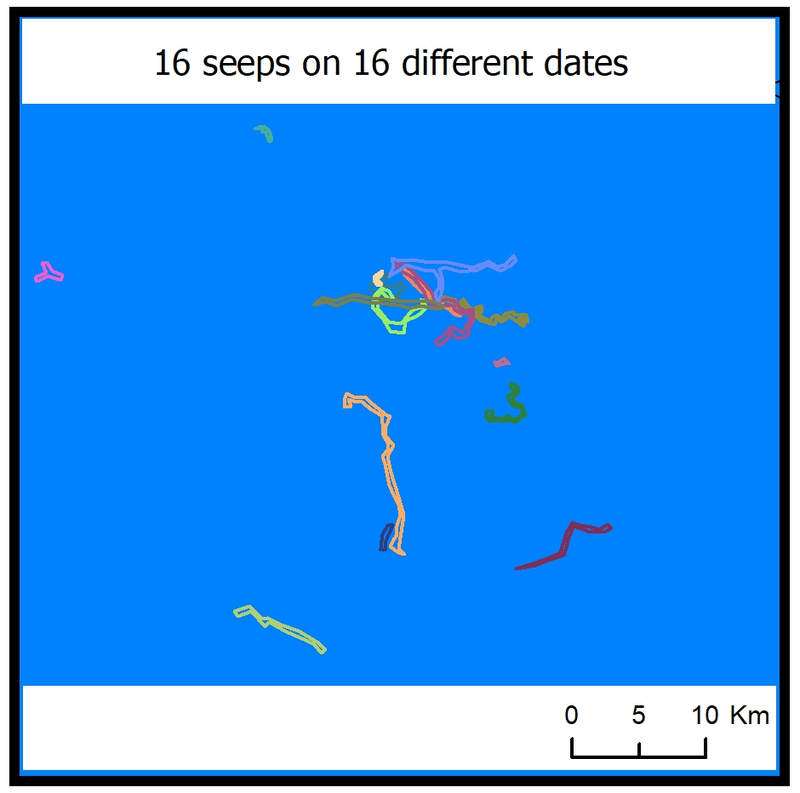 Figure 3: Previous seeps and new prospective seep areas identified by recent seep studies. Source: Jarðfeingi. What matters most in seep studies is recurrence. It requires the gathering of large datasets to reach a high level of data coverage (i.e. the number of different SAR dates per each X/Y points of study zone). This enables us to give a statistically robust account over time of an area and its active seeping mechanisms. In Figure 4 we show four seep anomaly examples from the Faroes which demonstate good potential, due to both the repetitivity of seepages and the locations of the anomalies. The locations of the relevant blocks are shown on Figure 3. The seep anomalies shown in Figure 4 all feature concentrated and recurrent potential natural oil seeps with characteristic seep morphologies, which are outlined in Figures 5. Figure 4a: Seep anomalies on Corona Ridge around License 6103, at the convergent zone of the Steinvør, Corona and Foula Sub-basins. Figure 4b: Seep anomalies off ‘Fugloy Island’ around License 6205, north of the Annika Sub-basin. Figure 4d: Seep anomalies on Wyville Thomson Ridge around License 6009, between Bill Bailey’s High and Faroe Bank High. Figure 5: Natural oil seepages detected on SAR data (top line) and (lower line) vectorised (yellow outline). According to available Bouguer gravity maps (Ólavsdóttir et al., 2016), two of the seep anomalies shown in Figure 4 seem to be located on gravity lows (Figures 4b and 4c, part of licenses 6103 and 6009,) in the very centre of the basins, while the other two other anomalies (Figures 4a and 4d, part of licenses 6205 and 6108) are located on gravity highs, at the edges of the basins. The first two might match oil which has migrated vertically directly from the mature source rocks, while the second two could be the result of longer lateral migration pathways towards structural highs and subsequent vertical migrations. These four anomalies therefore allow us to draw a sketch of the extension of the whole Faroese hydrocarbon system, by corroborating the existence of the critical parameter of Jurassic source rock presence and its effective generative domains. However, given the tectonic and therefore the thermal history of the study area, another hypothesis could be that Eocene source rocks, mainly Ypresian, are present within the basaltic series, as exhibited onshore Faroes on the island of Suðuroy (the coals and claystones of the Prestfjall Formation, as described by Passey, 2008) and they could correspond to the large extension of the Paleocene/Eocene maximum thermal event or the Azolla event, both of them well described further north in the Arctic of Alaska and Russia. This source rock could have undergone the thermal event linked to the rifting and subsequent opening of the North Atlantic Ocean and accordingly entered the oil window. .© Bernard Cooper. At the moment, many factors seem to stand in the way of success for the Faroes, such as present oil prices clearly not favouring such areas, not to mention the fact that most oil companies have departed the islands. This rather gloomy situation gradually led to the relative (yet anticipated) failure of the 2018 Faroese 4th Licensing Round; however, hopes of a major breakthrough have to be kept alive, and there are plans for a future round jointly with the UK, possibly in 2019. Apart from these new seep data locations providing fresh insights, discoveries in the former ‘White Zone’ just cannot remain one-sided forever, for geological and basin boundaries are fortunately far more complex than the limits set by political and country borders. Andersen, A.B  Cenozoic basin development and stratigraphy of the Faroes area. Petroleum Geoscience, 9, 189-207. Moy, D.J., Imber, J. A critical analysis of the structure and tectonic significance of rift-oblique lineaments (‘transfer zones’) in the Mesozoic-Cenozoic succession of the Faroe-Shetland Basin, NE Atlantic margin. Journal of the Geological Society, 166, 831-844. Passey, S.R  The Volcanic and Sedimentary Evolution of the Faroe Islands Basalt Group. 33rd International Geological Congress Excursion Guide N° 6, 15-22 August 2008. Jarðfeingi, 1-113. Ziska, H  Fracture orientations onshore Faroe Islands (North Atlantic); evidence for dual rifting episodes in the Palaeogene ? In; Varming, T. & Ziska, H. (Eds) Proceedings of the 3rd Faroe Islands Exploration Conference. Annales Societatis Scientarum Færoensis Supplementum, 56, 40–58. Clément Blaizot younger days were spent travelling the world, from Italy to Norway, Angola, Faroe Islands and Scotland, thanks to an oil-hunter of a father. Clément graduated from the French National School of Geography (ENSG) as a GIS engineer in 2011. He quickly fell into Remote Sensing and especially SAR (radar) based seeps interpretation. In 2017, after being involved in over 100 offshore seeps studies worldwide for various oil companies, he decided to launch his own company, GEOESPACE, dedicated to Earth observation from satellite data. 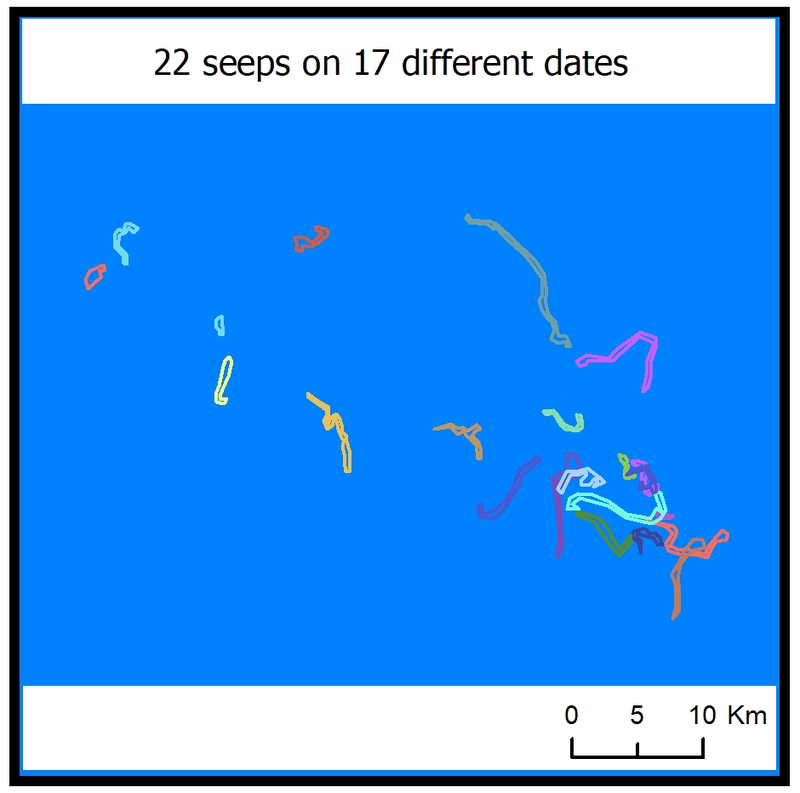 Latest promising seeps additions within GEOESPACE Seeps Database (GSD) include Eratosthenes, Levantine Basin, Natal Basin (South Africa), Sao Tomé, Sri Lanka, Cuba, Porcupine Basin and Faroe Islands. 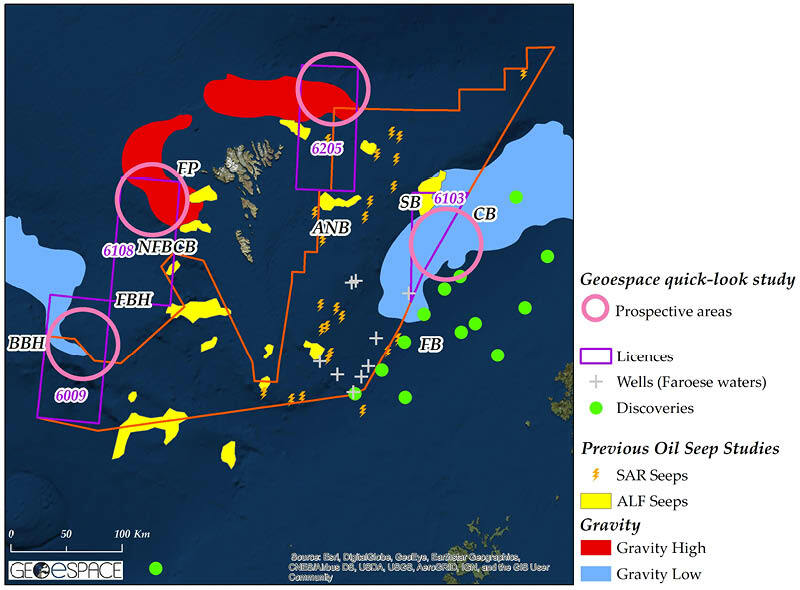 Some recommended GEO ExPro articles relating to, or similar in content to oil and gas exploration of the Faroe Islands. An under-explored wonder, tucked far away in the middle of nowhere in the North Atlantic Ocean. Faroe Petroleum’s focussed exploration strategy, concentrated chiefly on the challenging waters of Norway and the Atlantic Margin, is paying off. For years the Faroe Islands have had to look on while their larger neighbours in north-west Europe have extracted untold riches in hydrocarbons from offshore acreage. Has their turn finally come? With majestic mountain peaks and your own private beach to greet the midnight sun, scenic Senja, often referred to as a miniature Norway, is a hidden treasure for geotourists and adventurers. Using Landsat-8 thermal infrared images, geoscientists at the Yellowstone Volcanic Observatory recently identified the emergence of an entirely new thermal area in the National Park.